Lawn construction starts with the knowledge that your lawn is only as good as the material it will grow on. If drainage needs to be improved then a sandy base can be provided followed by the installation of topsoil. Organic compost can be mixed in with the topsoil to add organic matter & improve moisture retention. If a sprinkler system is a part of your plan we can work with any company you have selected or recommend a company that we work well with. Sodding a lawn is a luxurious way to get perfect turf instantly. 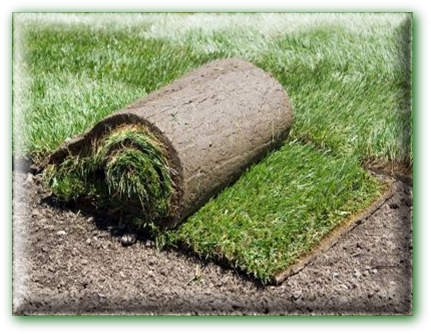 To get the most out of your sod lawn, we will make sure that the topsoil the sod is going over is of good quality and sufficient thickness, and if not we can mediate this with additional composted topsoil for optimal results. a sprinkler system to maintain its beauty. 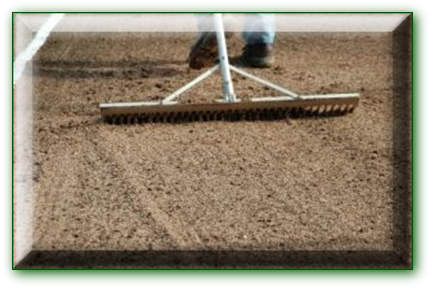 We will gladly coordinate a sprinkler system installation as a part of any lawn construction project. .
Grass seed is applied with a rotary spreader in two directions, 45 to 90 degrees from each other to provide the most even coverage. The seed is then lighlty raked in for maximum seed to soil contact. 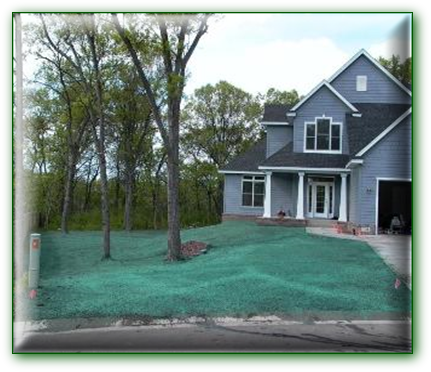 A hydroseeded lawn immediately after application. In a few days, the green color fades and is soon replaced with seedlings which grow rapidly. Expect a first mowing in about four weeks. Sod is rolled out in staggered rows. In several days, new roots will have formed, anchoring the turf to the soil. Expect a first mowing in two to four weeks.